Two jihadists, including a woman, have been executed in Jordan following the killing of one of its air force pilots by Islamic State (ISIS) militants. The woman, failed suicide bomber Sajida al-Rishawi, and al-Qaeda operative Ziyad Karboli – both Iraqi nationals – were hanged at dawn, officials said. The executions came hours after ISIS posted a video appearing to show pilot Moaz al-Kasasbeh being burned alive. Moaz al-Kasasbeh was seized after crashing during an anti-ISIS mission over Syria in December. 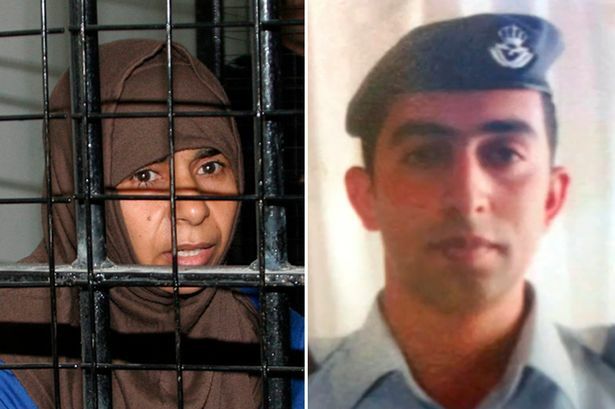 Jordan had attempted to secure Lt. Moaz al-Kasasbeh’s release in a swap involving Sajida al-Rishawi. Sajida al-Rishawi had been on death row for her role in attacks in Jordan’s capital, Amman, which killed 60 people in 2005. Ziyad Karboli was convicted in 2008 for killing a Jordanian national. The two prisoners were executed at 04:00AM local time, government spokesman Mohammad al-Momani said on February 4. Jordan earlier vowed an “earth-shattering” response after ISIS posted a video online showing what militants say is the pilot standing in a cage engulfed in flames. Mamdouh al-Ameri, a spokesman for the Jordanian armed forces, said on February 3 that Lt. Moaz al-Kasasbeh had “fallen as a martyr”. Jordanian state TV reported that Lt. Moaz al-Kasasbeh was killed a month ago. Jordan, which is part of the US-led coalition against ISIS, had tried to secure Lt. Moaz al-Kasasbeh’s release as part of a prisoner swap, offering to free Sajida al-Rishawi in exchange. But ISIS had sought her release as part of a deal to free captive Japanese journalist Kenji Goto. A video that appeared to show Kenji Goto’s dead body was posted online four days ago. Jordan’s King Abdullah hailed Lt. Moaz al-Kasasbeh as a hero, saying Jordan must “stand united” in the face of hardship. The king decided to cut short a visit to the US after news of the pilot’s death, but he met President Barack Obama on Tuesday evening before flying home. Many in Jordan have questioned its role in the air strikes against ISIS but the two leaders sought to reaffirm their joint resolve to destroy the group.